Very few of us keep a regular check on our roof. While it may be the roof over our heads, when it comes to home maintenance, it is usually overlooked. Indeed, its often only when something goes wrong that we even consider tile repair or tile roof restoration. A homes roof endures a lot. Over time, extreme weather, heat and storms take their toll and it’s common to see moss, rust and rotting tiles that are in need of urgent replacing. Pests can also do their damage and here in Adelaide, rats and possums in particular can dislodge tiles causing them to chip or crack or worse still, fall from the roof completely. Our experience tells us that most roofs need attention after about 15 years, especially if you have concrete tiles which tend to deteriorate more rapidly than terracotta tiles. That’s why if you have a tile roof, you’ve come to the right place at Rite Price Roofing. While contractors, mainly painters and handymen, have been cleaning and painting roofs for the last 100 years, it was mainly metal roofs they painted. In fact, it was quite rare to paint a tile roof and it has only been in the last 30 years that painting tiled roofs has become common. However, it’s important to remember that with most tiled roofs, you can’t just paint them. There is usually repair work to be done and often significant preparation before that first lick of paint. Why Rite Price roof restoration is the right choice. Tile roof restoration involves cleaning and repairing your tiles before re-pointing and sealing them so that they are sturdy enough to endure all manner of conditions for years to come. At Rite Price roofing, we are proud to have more than 25 years experience in roofing so we know what we are doing. We are a locally owned company which means we understand South Australian conditions and we know the kinds of pressures your roof is facing. We also use only the best quality materials from Acryloc and Revolution Roofing so you know you are in good hands. No job is too big or small and access isn’t a problem either as we can manage two storey roofs, pitched roofs and those that can be very difficult to access. It’s all part of the service. And Rite Price Roofing is also very competitive on price, delivering a result that will add real value to your home, giving it an instant facelift and added street appeal. If you want peace of mind, knowing that your roof is weather proof, storm and pest resistant and can keep you and your family safe and protected, then give us a call. Looking after your roof now could save you big money in the future. That’s got to be a good investment. Call us now on 08 8343 5988. 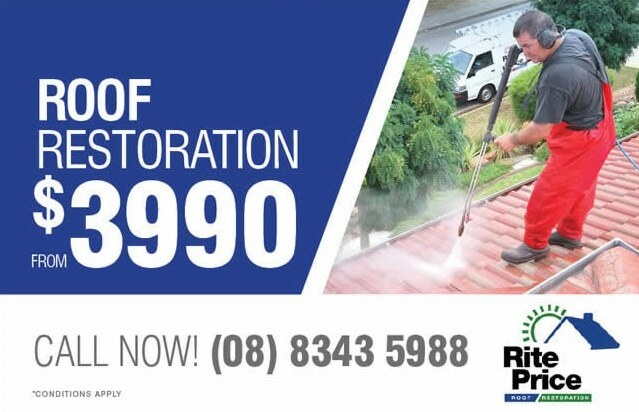 Rite Price Roofing, proudly South Australian.